With those light nights and warmer evenings finally here, it’s the perfect time of year for getting out in the garden with family and friends. 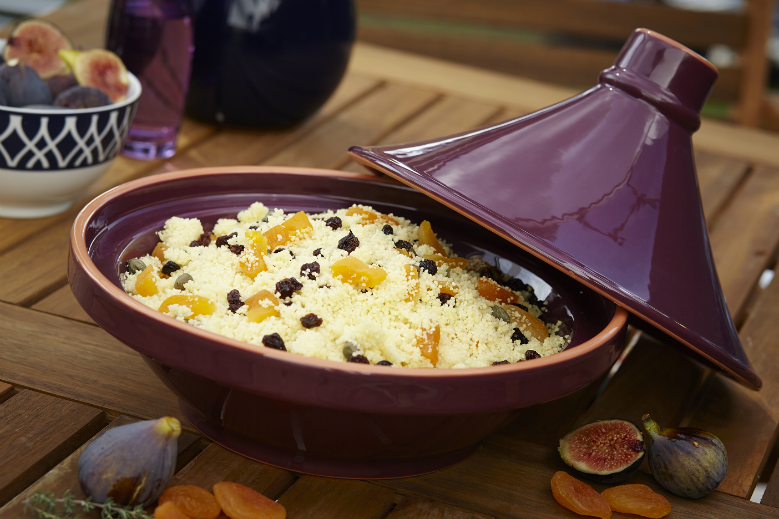 Our Moroccan cous cous recipe is perfect for barbecues or dinner parties and will provide a bit of heat if you get rained off! 1. Boil your kettle and pop your cous cous in a bowl, adding a knob of butter and a pinch of salt. Pour over just enough boiling water to cover the cous cous and cover with clingfilm. Leave the mix for around five minutes (until the water has been absorbed) and use a fork to separate the grains. Add a bit of salt and pepper for taste. 2. Next, warm some olive oil in a large frying pan and very gently fry your garlic, apricots, raisins and pumpkin seeds with the cumin and fennel seeds. Be careful not to use too much heat! Once the fruit has softened and absorbed the flavours – usually after around five minutes – remove from the hob and add to your cous cous, stirring thoroughly. 3. Finally, pop your creation in a nice dish ready to serve. We served ours in a Moroccan tagine for an authentic, decorative touch but we’ve got loads of other suitable stuff to choose from. Ta-da – it really is as easy as that!